6. To make the frosting: In the bowl of an electric mixer fitted with a paddle attachment, thoroughly mix together the butter and cream cheese. Add the lemon juice, zest, and salt and mix to combine. On low speed, add the confectioner�s sugar, one cup at a time until you reach the desired spreading consistency. To finish, frost the cooled cupcakes and serve. For six months after we first met, I eagerly awaited the debut of her blog. When it finally launched in February, I was blown away. Mary�s writing was eloquent and personable, her photographs were beautiful, and her recipes looked delectable. Every item appeared so delicious that I was left with the difficult choice of which to try first. 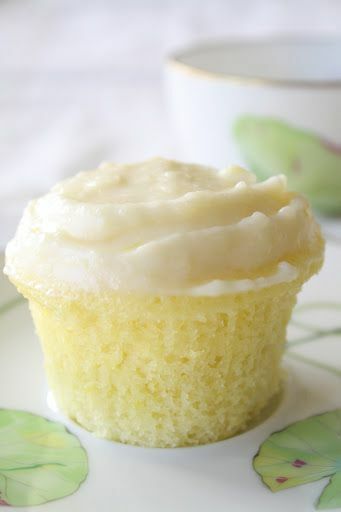 After much deliberation, I decided upon these light lemon cupcakes. What makes these treats so airy is the freshly whipped cream that is folded into the batter before baking. The cake�s texture resembles that of a cloud, irresistibly soft and puffy. The dough contains a subtle tanginess from the lemon juice and zest, complemented perfectly by the decadent cream cheese frosting. After this experience, I cannot wait to try more recipes from Mary�s fabulous site.